On June 28 DEQ head Dan Wyant untimely rejected the petition. The plaintiffs filed suit with Judge William Collette in Ingham County Circuit Court. They have moved for summary disposition, the hearing for which is now set for October 3. 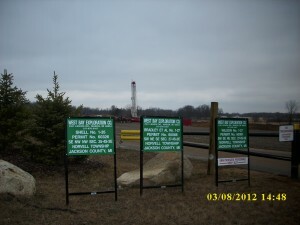 A frack well by Devon in Gladwin County and warning sign at the gate about the risk of deadly Hydrogen Sulfide gas leaks. Photo by LuAnne Kozma. Charlevoix–On April 27, 2012, Ban Michigan Fracking, together with Deanna Hughes and Heather Schiele, filed a request for a declaratory ruling with Michigan Department of Environmental Quality (DEQ) director Dan Wyant, asking the agency to treat frack wells statewide as injection wells, and to suspend issuing frack permits while it decides the petition. The petition notes the gas industry agrees a frack well is an injection well, so the DEQ should too. A ruling would mean applicants for frack wells would have to provide data, among other things, about the chemical analysis of the types of fluids to be injected. The data would have to be provided at the time of the application so nearby landowners can do efficient baseline water testing before drilling commences. Hughes and Schiele live in Sherman Township, Gladwin County, where Devon Energy is about to start horizontal fracking in the A-1 Carbonate layer, a bit shallower than Utica-Collingwood. Landowners and residents nearby to other frack wells are welcome to join the request. 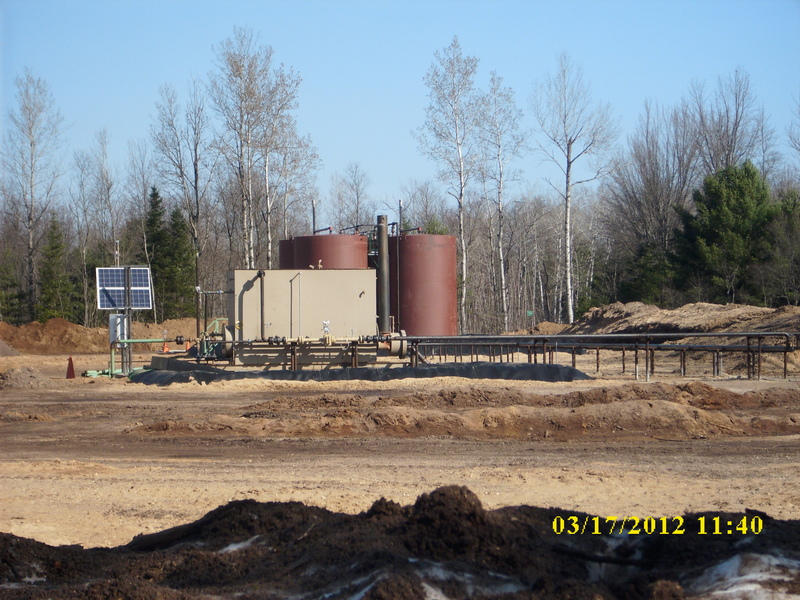 Encana's existing well in Pere Marquette State Forest in Excelsior Township, Kalkaska County, where more horizontal frack wells are planned. Photo by LuAnne Kozma. 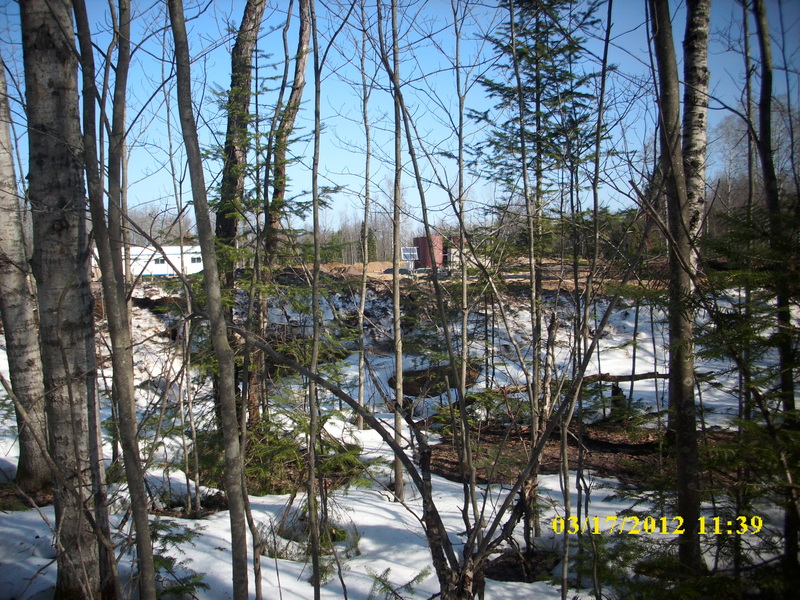 The Michigan Department of Environmental Quality (DEQ) announced on April 8 that EnCana and Gas USA (a Canadian company) had applied for six new wells on state-owned forest land in Kalkaska and Cheboygan Counties. A seventh well was applied for a week later. All seven target the Utica-Collingwood shale formations, though they are described as oil wells not gas wells. Two in Kalkaska County — on the line between Oliver and Excelsior Townships — are over three miles deep, and separated on the surface by 50 feet. Devon, another major energy company, filed applications for permits to drill in the Utica-Collingwood shale in Richfield Township in Roscommon County on state land. A note on the announcement indicates the two deep ones would be the second and third wells in a DEQ-granted 1280-acre spacing exemption. DEQ application forms do not require that oil-gas applicants disclose whether they intend to frack. As part of the completion process, frack well operators in Michigan typically inject 5 million gallons of water, chemicals, and sand down the hole. However the DEQ does not consider frack wells as “injection wells.” It grants permits to frackers without requiring them to follow injection well rules — such as disclosure of the maximum rate, specific gravity, and pressures of the injection, chemical analysis of the injectate, and information showing the job will not initiate fractures through overlying strata. 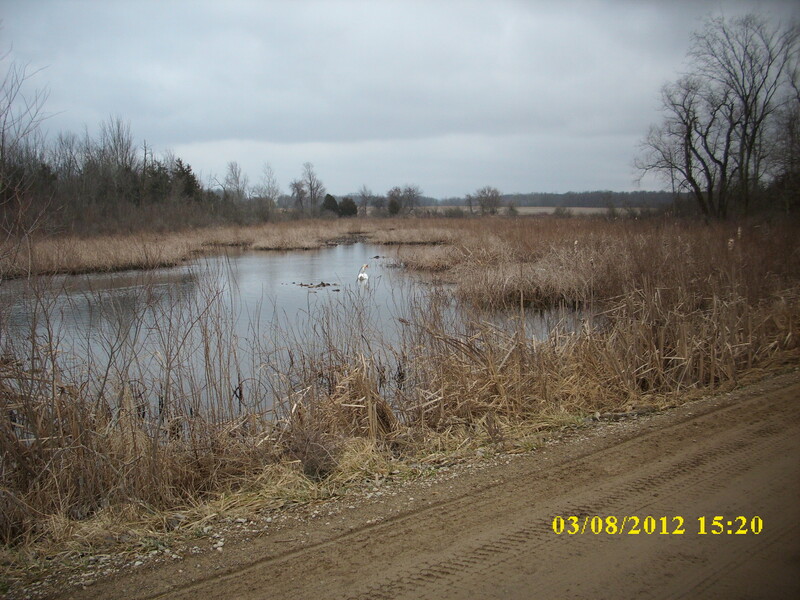 It has granted permits where proposed wells failed Michigan’s water withdrawal assessment tool even though waivers given after DNR site visits specify no facts or reasoning. Horizontal fracking in Michigan’s pristine state forests is bad news. Even on private land, the industry-funded DEQ cannot be trusted to assure the health, safety, and welfare of our citizens. We need to stop the Encana and Devon wells right now — not merely postpone them in a moratorium. See why Ban Michigan Fracking is opposed to the “frack reform” legislation that would rely on a moratorium tied to a DEQ-run frack panel and a gas industry-funded frack study. 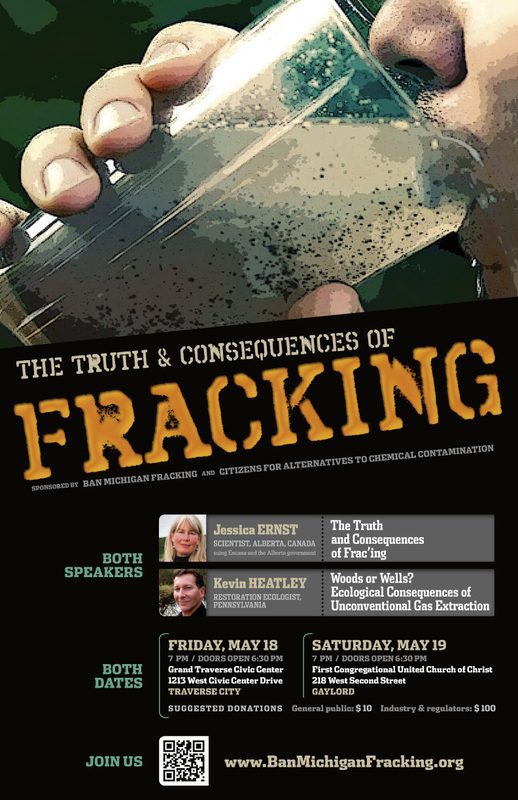 Encana’s contamination of Alberta, Canada and fracking’s devastating effects on forest are the topics of Ban Michigan Fracking’s forums on May 18 in Traverse City and May 19 in Gaylord. Come hear experts Jessica Ernst and Kevin Heatley speak of their efforts battling Encana in Alberta, and dealing with forest fragmentation and ruination in Pennsylvania. The events are co-sponsored by Citizens for Alternatives to Chemical Contamination (www.caccmi.org). Alpine Township’s Oil & Gas Meeting: the Landmen are Coming! Excelsior frack well in Michigan's Pere Marquette State Forest in Kalkaska County. Photo by Maryann Lesert. The tone of the March 26 Alpine Township meeting was decidedly different than another recent meeting that took place across the state. On March 8, responding to public pressure, State Representatives Mike Shirkey (R-Clark Lake) and Earl Poleski (R-Jackson) hosted a public comment session in Brooklyn where residents of southeast Michigan’s Jackson and Lenawee counties have moved beyond the leasing stage and are now experiencing the full rush of trucks, drill rigs, gas flares, and processing facilities that go along with gas and oil drilling. The 600 residents of the rolling hills and wetlands of Brooklyn’s Irish Hills who attended the meeting voiced a myriad of environmental concerns. Many were clearly worried about West Bay Exploration’s request for permits for two deep injection wells in the area, where contaminated waste water (“brine” as the industry likes to call it) would be injected into deep wells drilled below ground and surface waters. At the Brooklyn meeting, water use and contamination were on a lot of people’s minds. 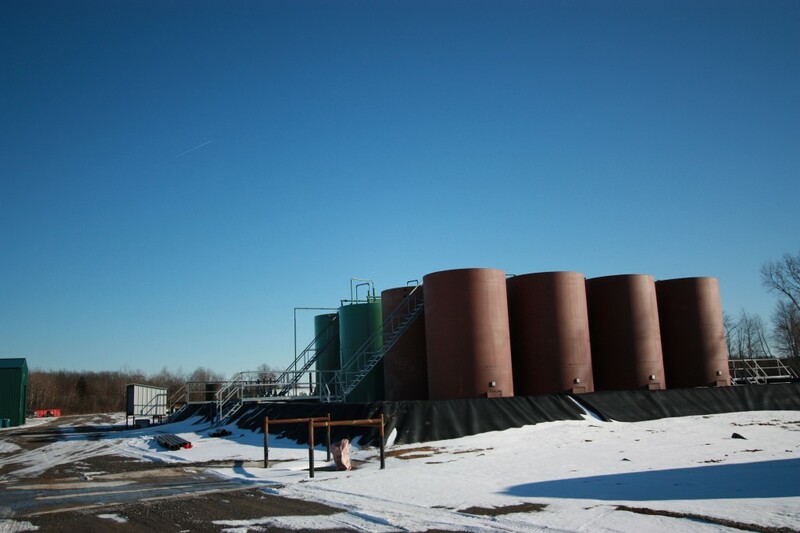 "Tank farm" in the Irish Hills near Brooklyn, Michigan, 2012. Photo by LuAnne Kozma. I arrived at the Alpine Township hall a bit late but still in the early stages of DEQ geologist Mike Shelton’s presentation on hydraulic fracturing. Unlike what residents of the Irish Hills experienced, with West Bay Exploration (the Traverse City firm drilling under Brooklyn’s water shed and lakes) insisting that “We don’t frack,” Shelton’s Alpine presentation made it clear that the landmen (industry term) visiting landowners in this area were seeking mineral rights leases meant for deep horizontal drilling and hydraulic fracturing. Shelton used slides to depict the process, showing well construction beginning with a vertical drilling, typically 5,000-10,000 feet deep to get to the shale rock layer. He then explained how advances in drilling allow contractors to turn and drill horizontally for another mile or so in one or more directions. 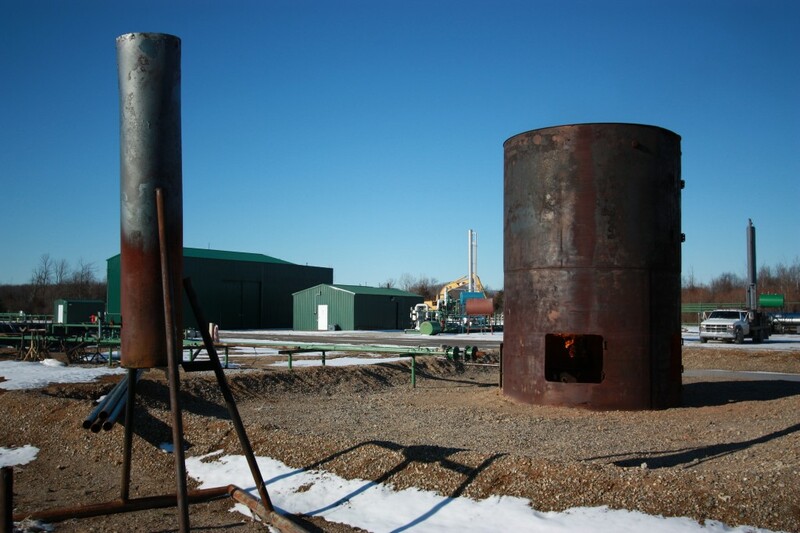 He noted that large volumes of water, chemicals, and sand are pumped deep into these wells at high pressure, sometimes up to 11,000-psi, causing the shale rock to crack open or fracture in several places. The gas in the rock then flows out of the shale and into the well as a liquid. Water and chemicals shot into the well also come back up as what the industry calls “brine” or “flowback” or “produced water.” This waste water must then be disposed of in deep injection wells because it contains chemicals, and DEQ regulations say that this “water” can’t be disposed of above ground. A few audience members asked questions about how gas and oil contractors decide where to place a well on the property, and what types of wells might be constructed. Shelton showed a slide of the tall drill rig that comes in for a month or more when the well is being actively fracked. He also showed an aerial slide of a typical processing facility with an open fresh water pit and a second pit where drill cuttings and mud are dumped and dried out for later burial or disposal. But he didn’t mention that these muds contain toxins brought to the surface by fracking. Instead, he called attention to the amount of equipment and trucks that can be on site during the process, which is common at informational meetings. Presenters often address truck traffic, aesthetics, and road construction openly with the public. 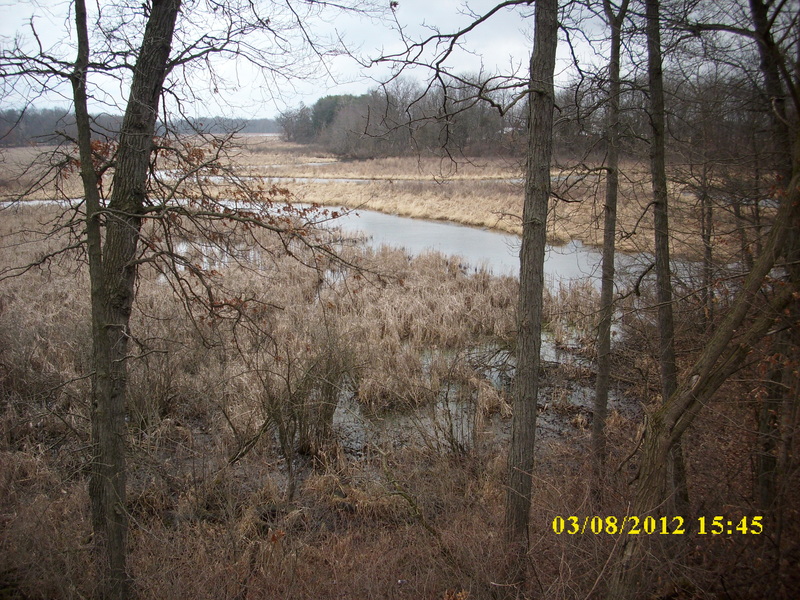 Raisin River wetland in the Irish Hills. Photo by Maryann Lesert. The geologist’s comments downplayed chemical concentrations and toxicity. He emphasized that “out of the large volumes of water used” which he admitted could be millions of gallons per well, “out of all the fluid, about 98 to 99 % of it is water and there’s only a small percentage of chemicals.” He described chemicals used as “things like detergents, everyday chemicals, but also things you wouldn’t want in your drinking water.” He spoke of regulations that require contractors to have “MSDS [Material Safety Data] sheets on site,” but neglected to say that for undisclosed chemicals – additives that frackers are allowed to keep secret – there are no safety sheets on site. At one point the DEQ geologist said, “There is no history of contamination or spills in Michigan.” But according to another DEQ official’s statements during the March 8 meeting in Brooklyn and a follow-up article by Detroit Free Press environmental reporter Tina Lam, this claim of zero contamination is not true. One of the most recent accidents made public occurred on Dec. 24 of 2011 when hydrogen sulfide (industry term = sour gas) leaked for 4-6 hours from a Crawford County injection well, sending a cloud of the toxic gas fuming all the way to Canada. [Ban Michigan Fracking also reported on it in December 2011]. 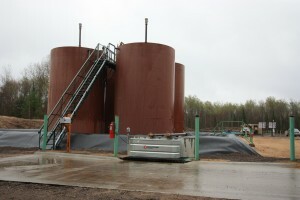 Natural gas flared off on an oil well site in the Irish Hills. Photo by LuAnne Kozma. When a question or two came up about water use, he mentioned that contractors drill a water well on site, drawing water from the landowner’s property, but downplayed concerns about water levels, saying that the DEQ requires contractors to report water usage. Report, yes, but not limit. In May of 2011, in a document the DEQ likes to tout as strengthening water regulations, the Office of Oil, Gas, and Minerals exempted the oil and gas industry from the 100,000 gallons-per-day withdrawal limit that Great Lakes water activists had worked toward for years. An Excelsior well site in Kalkaska County. Photo by Maryann Lesert. 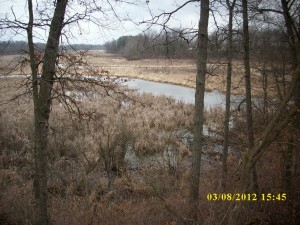 An Irish Hills wooded wetland. Photo by Maryann Lesert. Shelton, from the Kalamazoo DEQ office, walked to the back of the room to discuss these questions privately with me as Talley took the floor. I expressed concern that his presentation came across as pro-leasing, and we discussed studies and risks at length. 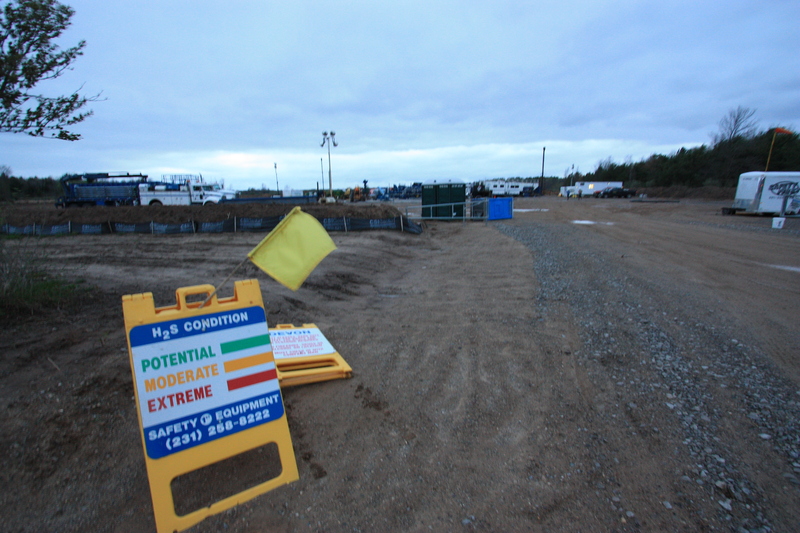 What about toxins and carcinogens that are buried in on-site pits? Or metals and salts and radioactive elements that come up in the “brine” that the industry likes to call “water”? What about Duke University’s finding that drinking water wells near fracking sites have 17 times higher concentrations of methane than samples more distant? But the public, of course, was not privy to our one-on-one discussion of broad-scale environmental concerns. And as soon as Shelton and I separated, three men from the audience accompanied the young geologist into the township’s backroom kitchen, where they remained behind its closed door for twenty minutes. The rest of the meeting flowed smoothly, with Talley presenting a landowner’s right to lease mineral rights as a “blessing” (his word, not mine). “It’s a blessing to own mineral rights and to have this opportunity,” he said. Drill rig going up in the Irish Hills, March 2012. Photo by Maryann Lesert. He mentioned, two or three times during his presentation, that whether or not to sign a lease is up to the landowner, noting that “it isn’t fair to the gas and oil companies” to sign a lease when a landowner isn’t supportive of drilling. His “Psychology of Leasing” slide encouraged landowners to be firm in negotiating with experienced landmen. Be “price makers, not price takers.” He used a slide from a Colorado site that had barely discernible well pipes rising like tall grasses against a broad landscape and said, “There are 33 wells on this site.” I pictured the huge drill rigs I’d seen going up in the Irish Hills just a few weeks before, and the processing sites with tanks upon tanks and flaring fires. During the March 8 meeting, Hal Fitch, DEQ Assistant Supervisor of Wells, whose office approves oil and gas drilling permits, explained Michigan’s compulsory pooling law like so: A well site requires 40 acres. 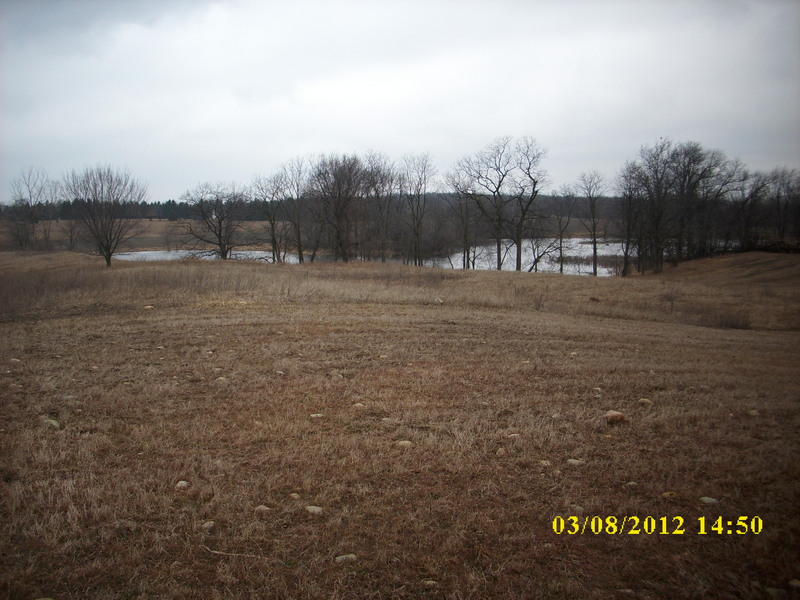 If landowners who own 38 of the acres sign a lease, but a landowner owning the remaining 2 acres refuses to sign a lease, the state (DEQ) can put the landowner into a “pool” for the purposes of drilling on the site. 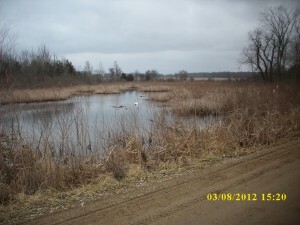 An Irish Hills wetland next to a drilling rig, March 2012. Photo by Maryann Lesert. A third presenter, Trent C. Hilding, Esq., answered questions about the legalities of negotiating leases. He advised audience members to make sure that their leases included a ‘no processing facilities’ stipulation. When an older man who had come over to thank me for bringing up environmental questions asked whether a landowner could add language to a lease to make the company responsible for environmental contamination and cleanup, Hilding answered yes, landowners could add contamination terms. I wanted to question whether such terms could be enforced with the gas and oil industry exempted from practically every environmental regulation we have at federal and state levels, but the meeting was adjourned before I got the chance. “How many acres do you have to lease?” he said, more loudly. “I’m still not sure what that has to do with anything,” I said. For that man, and for others who expect the Department of Environmental Quality to put the long-term health of our ecosystems and communities before short-term profits, I left the meeting wondering, will the public get the information it needs to understand what fracking really looks and smells and sounds like? How can the public assess fracking’s risks when it comes to contaminating our communities – potentially forever? What about the people in Alpine Township and around the state of Michigan who are not land owners? How will the larger public come to understand that the landmen are coming? That the landmen are, in fact, already here? Maryann Lesert is an author and Associate Professor of English at Grand Rapids Community College, researching fracking for an environmental writing project. She belongs to Ban Michigan Fracking, (www.banmichiganfracking.org) an educational organization working toward local and statewide bans on hydraulic fracturing. This article originally appeared on the Grand Rapids Institute for Information Democracy website on March 31, 2012.